British universities have a lot to think about. Draft legislation going through Parliament could override the symbols of the autonomy and academic freedom of British universities, represented by Privy Council charters. A new government-appointed regulatory body would be dedicated to opening the market to ‘higher education providers’, and serving students better as ‘customers’. The Bill would also corral all the research councils into a single strategic body rather than as a series of discipline-led institutions. At the same time, the politics around higher education and Brexit are tense. Universities – leaders, academics, researchers across the board, students – who were overwhelmingly for Remain have been shaken by the referendum result. LSE graduands in 2014. Photo: copyright LSE. The sector had banked on a vote to stay, having fought the case during the campaign that without EU membership, cutting-edge research would be hit catastrophically, job creation would be stalled, UK universities would find it a great deal more difficult to attract and retain talented students and staff, British students and staff would be deprived of some of the life-changing opportunities of easy mobility for study and work which come through EU freedom of movement, and there would no longer be secure funding for the EU element in the kind of research public opinion supports, such as disaster prevention and seeking cancer cures. Theresa May’s government responded rapidly with a short-term fix. She promised the powerful science sector ‘a positive outcome’ within days of becoming PM: ‘We are not turning our backs on European science’. Then when European scientists seemed to be turning their backs on the UK, by disinviting British researchers to join their projects, the Chancellor Philip Hammond jumped in. The UK will underwrite the costs of participation in EU programmes until the end of the present cycle in 2020. So even if the UK leaves the EU in 2019, as currently expected, UK universities teams can remain part of current Horizon 2020 projects and those in the Regional Cohesion funds. What about the longer term? Insofar as Leave had an agenda for higher education and research, it was the glorious future of Britain and the Open Seas. The UK government would use the funds recovered from the EU budget to fund EU contributions to national research, and charging EU students fees would contribute nicely to university income, adding significantly to annual income (which is currently running at £30.7bn). There would also be a feel-good factor, as well as a market opportunity to welcome deserving students from the rest of the world. The general message was that vice chancellors should stop panicking – a prediction optimistically based on the view that EU directives pertaining to an open policy on research would survive regardless of the eventual Brexit deal. In this policy area, as in others, there was no post-Brexit plan. Universities UK, the sector’s leadership body, is now urging its adherents and a wider policy community to think beyond the Eurocentric. It has lobbied the UK government hard, and apparently successfully, for science to be part of the Brexit negotiations. It is pressing for transitional arrangements for 125,000 EU students and 43,000 EU staff in UK universities. But in face of the apparently inevitable, the UUK message – as delivered by a senior official – is that the sector must set out ‘a vision with global ambition’ of which ‘Europe may, or may not, be part’. Expect others to take up this line more forcefully in arguing for global market opportunities to replace ‘over-reliance’ on EU students and EU research funding. The post-EU case revolves around Britain’s standing in various global Top 10 rankings. Britain is currently second only to the US as the favoured destination for international students. It has an enviable record of achievement in research impact as measured by cross-border co-authorship in which the US is the most sought-after partner. Britain on the more changeable innovation index, developed by Cornell University, is currently in second place to Switzerland. But Top 10s can be misleading. No system of higher education and research can be purely national. The challenge is to create viable forms of transnational collaboration for higher education and research, a strategy which requires institutional back-up and funding as well as ideas. It is likely the UK government and the sector will be thinking in terms of how to strengthen four of the existing strands of its internationalisation policy. The US attracts nearly 800,000 students from around the world. The UK comes next with 416,000. These students are essential to the financing of UK universities. Fees from all sources make up 40% of university income. 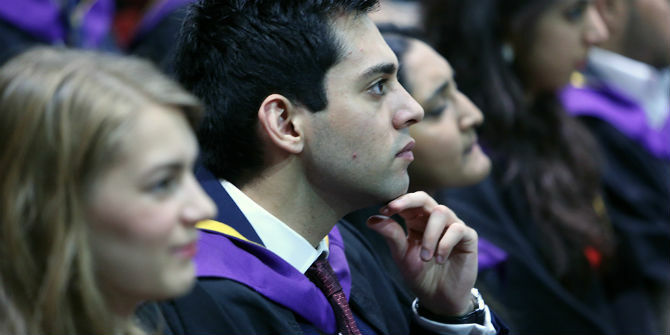 International and EU students are especially important to postgraduate courses. They largely sustain masters’ courses and make a crucial contribution to the UK research base. Non-UK EU and international student who make up 18.9% of the student body are 38% of the postgraduate total, and just over half in postgraduate research. In terms of territorial origins, UK marketing strategy for international students has focussed on trading partners. Chinese students form almost 20% of the total (Tables 2 and 3). Sources: as for Table 1. But statistics fluctuate. Far fewer Indians now come to Britain than they did five years ago, deterred by the visa system imposed by Theresa May when she was Home Secretary. The post Brexit-battle within the Conservative government between tighter migration control and freedom of movement produces another policy uncertainty. In a competitive landscape many students might find alternative destinations more attractive (and cheaper) than post-EU Britain. In the UK’s favour is that British universities have a much better record than the competition in Anglophone countries of satisfying international students. Almost all students complete their course (95% UK, 64% US). Their unemployment rates are lower than the major international and European competitors. Those in the UK are more likely to recommend the UK system than their peers in the US, Canada, Australia or New Zealand, in terms of how they are treated on arrival, the learning experience, the support they receive and living conditions. International student recruitment is the relatively easy bit of a reinforced global strategy for the UK, despite the new visa complications this implies. The international market is 4.1m strong. There are opportunities for the UK if confidence in the UK is not shaken post-Brexit. Over 660,000 students are based overseas studying for UK higher education qualifications. The provision includes international campuses, joint schools, online programmes and degree validating partnerships. There are signs that UK universities may even be thinking of EU-based campuses post-Brexit. Transnational education of this sort is a growth area. The majority of students are in Asia and Africa. They are followed by Europe, including the Bologna Process countries of the Russian Federation and Turkey, and the Middle East. The post-Brexit enthusiasts look to an expansion of the famous MOOCs (Massive Open Online Courses). The UK-based MOOC platform Future Learn has only around 6% of the global MOOC market. But it is all on a small scale. While the first two options are economically attractive to the UK, that is not enough. In an era of globalisation, research and higher education need to be international and outward-facing. Strengthening bilateral arrangements is one way, and is favoured by Leavers. And what’s not to like in principle? The Higher Education Policy Institute recently gave Germany as an example where interest in closer relationships is mutual. Joint work between British and German researchers is second only to the US-UK connection in quantity. The German connection has also been more productive in terms of transnational partnerships than that with the US, according to a 2015 study by Elsevier-Bis (cited in Table 2). But vastly extending UK bilateral relationships to match the scale of what happens through the EU would be a highly demanding way of pooling infrastructure, data and expertise, and may not even be realisable on the scale now expected. Which brings us to the fourth option. Conceptually, the Anglosphere is the privileged UK connection with the US and the former British dominions of Canada, Australia and New Zealand. Though any formalisation as an organisation has been previously dismissed, there are recent signs that the idea has come in from the cold. Defence has always been a core domain. The Anglosphere global surveillance sharing (Five Eyes) revealed to the public by Edward Snowden is well embedded in UK policy. Why not higher education and research? Back in the Cold War, higher education used to be called the fourth dimension of diplomacy. There have been sustained efforts since 2007 to boost partnerships in higher education and research with the US when the Research Councils UK (RCUK) established a US office. It cites joint initiatives with the US: these include work with the US Department of Defense, the US National Science Foundation (NSF), and the US Department of Energy. All these are US-led. Among the examples are the Multidisciplinary University Research Initiatives (MURI) programme, led by the US Department of Defense, in collaboration with the UK Ministry of Defence and the Nuclear Energy University Programmes (NEUP) in which the Engineering and Physical Sciences Research Council (EPSRC) sponsors UK researchers’ involvement in several rounds of this initiative led by the US Department of Energy. However, experts say it is very unlikely that the Anglosphere can quickly match the EU on many of the things that have mattered to UK universities in recent decades. During the referendum campaign, Remain presented the way UK research is embedded in the EU as a measure of British success which would be hard to replicate. The argument was that behind the British record of winning excellence-based funding contracts was a whole dynamic of cooperation – which, thanks to the open science strategy of the EU, has been effectively open to partners throughout the world for collaboration, if not for funding or leadership. The EU is now a global hub of research. The EU collaborative partners of the UK by numbers of co-authored papers (see Table 1) with 153,000 papers between them outweigh the US (89,579) plus Canada and Australia (which total 135,800). For many of those directly involved, the connections between UK excellence and EU support are causal. The structures and competitive funding involved – from the European Research Council, the European Institute of Technology and its associated Knowledge and Innovation Centre, the Horizon 2020 programme and the EU programmes to support territorial and social cohesion – outweigh anything that could be achieved nationally or bilaterally. Another weighty consideration is that there are no significant alternatives to the EU funding from which the UK has benefitted by £1bn a year. UK investment in research is consistently lower than the OECD average. In many cases, as in the social sciences, EU funding has compensated for falling national investment. The importance of retaining some EU research collaboration in some form may yet be a bargaining chip with the EU, which values UK input. But that would depend on many ‘ifs’: the likelihood of a ‘soft’ Brexit first being put forward by the UK, and then being agreed by the EU27. Should the UK be totally out of the EU – Single Market and all – it is the UK Treasury and the new UK market-opening institutional structures for higher education and the new strategic body for UK research system at the centre of the Bill in Parliament which will take the strain. And a poor swap it will be. The UUK’s ‘red lines‘ say it all. If universities are to show that they are, as they traditionally boast, resilient and adaptable, they need (i) support to maintain and enhance the UK’s international research collaboration (ii) support to ensure UK is an attractive destination for talent (iii) increased public investment in the UK research base (iv) support for UK students and staff to access vital global opportunities. At the moment the opportunities for a new UK internationalisation strategy seem to revolve around the transactional arrangements for British higher education as an export industry. The threats are on the epistemic side. The government gives no sign of understanding the cultural and intellectual links that have been forged through European integration. UK universities may hope that they can retain international confidence over the coming months. But a hard government line on ‘taking back control’ will lose the universities and research centres many old friends and allies. Even more damagingly, it is a strategy that will hollow out those ‘top 10’ crowns that British higher education has worn proudly. There are already stories of fellow Member States circling around to pick up some of the pieces. Anne Corbett is the author of the LSE Commission Report on the Future of Britain in Europe on Higher Education and Research. She is an Associate of LSE Enterprise, and a former Visiting Fellow of the LSE European Institute.